남원양씨 종중 문서 일괄(南原楊氏 宗中 文書 一括)은 고려 공민왕 4년(1355)부터 조선 선조 24년(1591)까지의 고문서 7매이다. 양이시가 고려 공민왕 4년(1355) 과거에 합격했음을 알리는 합격증서인 홍패(1355)와 그의 아들 양수생 역시 우왕 2년(1376) 문과에 급제했음을 알리는 홍패 등 2건을 주축으로 하고 있다. 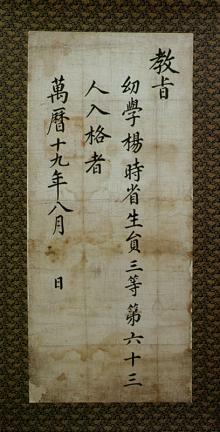 이 외에도 양공준이 조선 중종 3년(1508) 생원시에 급제했다는 교지와 다시양공준이 문과에 급제했다는 교지, 생원인 양홍이 중종 35년(1540)에 문과에 합격했다는 교지, 그리고 양시성이 선조 24년(1591)에 생원시에 급제했다는 교지 등의 합격증서가 있으며, 명종 14년(1559) 양홍을 청도군수로 임명한다는 발령장인 사령교지도 있다. 이들 문서는 고려 후기에서 조선 전기의 홍, 백패 연구에 중요한 자료이며 특히 양이시급제홍패와 양수생급제홍패는 조선시대의 합격증서에 교지라 쓴 것과는 달리 왕명이라 기록되어 있으며, 시험관의 관직, 성명 등이 기록되어 있어 문서의 형식 및 고려시대 과거제도 연구에 있어 매우 귀중한 자료로 평가된다. 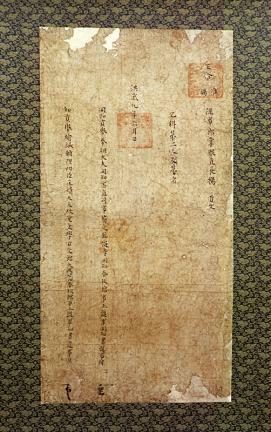 The documents of the Namwon Yang Clan comprise seven ancient documents dating from 1355 (the 4th year of the reign of King Gongmin of the Goryeo Dynasty) to 1591 (the 24th year of the reign of King Seonjo of the Joseon Dynasty). 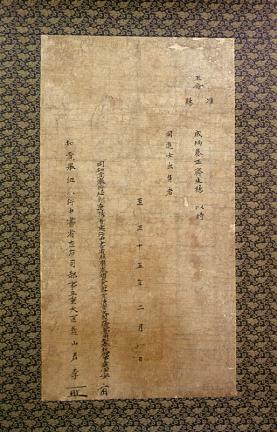 They include the Hongpae (certificate in red paper confirming success in the state examination) awarded to Yang I-si (1355) and his son, Yang Su-saeng (1376); royal orders certifying success in the state examinations of several members of the Yang family including Yang Gong-jun (1508), Yang Hong (1540), and Yang Si-seong (1591); and a royal order of appointment to the post of governor of Cheongdo County for Yang Hong (1559). 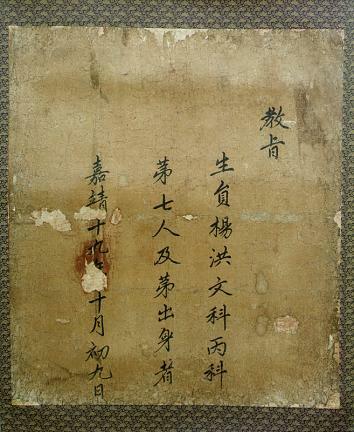 These documents are regarded as valuable materials for research on red and white certificates from the late Goryeo to the early Joseon periods. 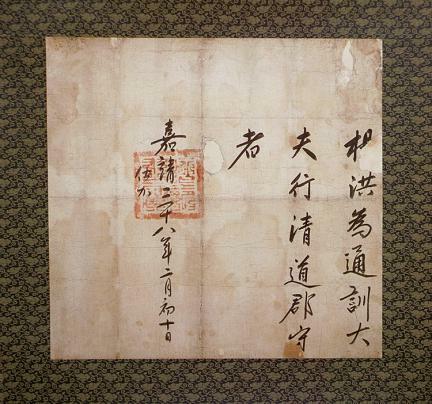 Regarding the hongpae of Yang I-si and Yang Su-saeng, it is noteworthy that their success in the state examination was recorded by ‘wangmyeong’ (king’s command) rather than by ‘gyoji’ (royal edict), which was inscribed on certificates of the Joseon period. 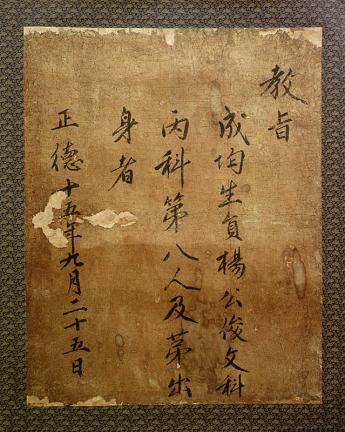 In addition, as the posts and the names of the examiners are included on the certificates, they are recognized as important historical materials for studying styles of documentation and the public examination system of the Goryeo Dynasty.